The majority of self-driving tech testing is happening on the pristine streets of sunny California, but across the Pacific, autonomous tech developers in Russia are also working to make robot cars a reality. But in the hellish driving environments found in Moscow, that’s not an easy feat, as a fascinating story from The Guardian recounts. Uskova isn’t wrong. Some automakers have lately taken to testing autonomous cars in cities that regularly face inclement weather, like Detroit, but for the most part, the development has been centered around Silicon Valley. That can’t last if autonomous cars are ever going to catch on. With roads that spread like a cobweb away from the Kremlin, disturbances like car wrecks, construction and government motorcades can wreak havoc for miles. Seat belts are scorned, and traffic laws widely ignored; speeding violations are enforced with $4 fines, paid by phone. 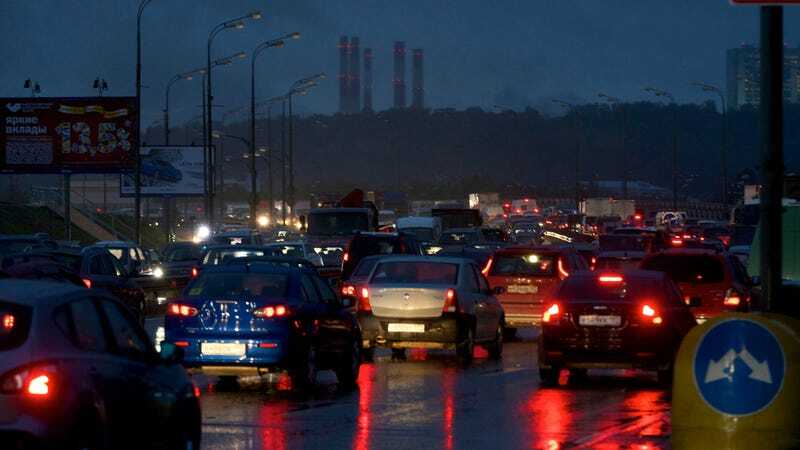 It’s no surprise that Russia’s rate of road fatalities is nearly double that of the US, with an average of 20 serious accidents a day just in Moscow. Or, for that matter, that dashcam videos of Russian road fights and collisions make up such a popular subgenre on YouTube. The Guardian visited a three-day “hackathon” event for driverless cars, and found that one common issue for driverless cars—signs—tripped up some of the engineers in attendance. Most cars struggled to identify signs, for instance, which were hard to detect in snow or rain; and for non-Russian speakers, the task was practically impossible. The story notes that car testing is limited in Moscow to a quarter-mile track outfitted with pedestrian crossings, road signs and a roundabout, so there’s still a ways to go before testing expands. But it offers relevant context for the auto industry: it’s going to be a slow crawl to expand autonomous driving across the world.